Basculin Blue in game: 1,306 Who? Important notice! Pokemon Basculin Blue is a fictional character of humans. Basculin (Japanese: ???? 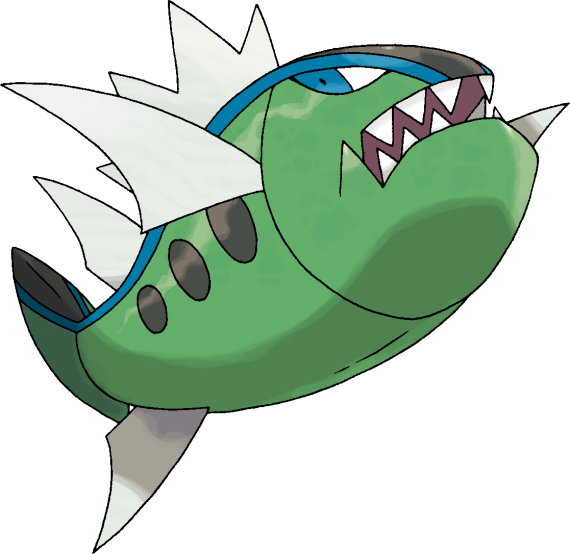 Bassrao) is a Water-type Pokémon introduced in Generation V.
While it is not known to evolve into or from any other Pokémon, it does have two different appearances: Red-Striped Form, which has a red stripe and irises, with a round eye and spiky fins; and Blue-Striped Form, which has a blue stripe and irises, with a slit eye and smooth fins. The bodies of both the red- and blue-striped forms are the same. 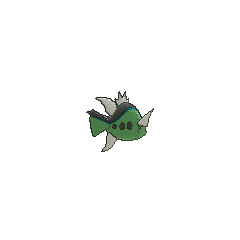 They have a green, ovoid body, tapering off in the rear to a trapezoidal tail fin. A thick black stripe covers the top of their body from mouth to tail and a white, dorsal fin with four protrusions resembling spikes. Their lower jaw juts ahead of their upper jaw, with a small indent near the edges of their mouth. Both forms have three black dots on both sides of their body, behind their pectoral fins. The main difference between the two forms of Basculin is the color of the stripe that separates the black and green on their body. 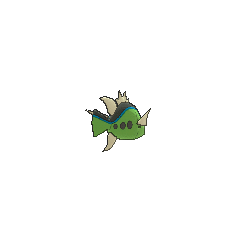 Both forms of Basculin have fins in the same places, with one on top of their body ahead of the tail fin, one below the body ahead of the tail fin, and two side fins. However, red-striped Basculin have jagged fins that resemble tridents, whereas blue-striped Basculin have smooth fins all around. Red-striped Basculin have circular, red eyes, while blue-striped Basculin have narrower, blue eyes. Both forms of Basculin are extremely hostile, especially towards their opposite form. Red- and blue-striped Basculin generally start fighting each other on sight. However, on rare occasions, one form may swim with the other's school. 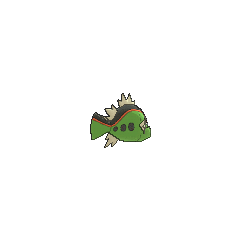 Basculin are also consumed by humans and are considered very delicious. Both forms of Basculin appeared in A Fishing Connoisseur in a Fishy Competition!. Cilan managed to capture a blue-striped one; however, a wild Frillish released it. A few other Basculin appeared during the episode. A red-striped and a blue-striped one were seen being reeled in by two unnamed Trainers. Iris managed to fish another Blue-Striped one with her bare hands but was penalized for it. A red-striped Basculin appeared in PK22. A photo of multiple Basculin appeared in The Four Seasons of Sawsbuck!. Multiple Basculin made an appearance in Stopping the Rage of Legends! Part 1 and Stopping the Rage of Legends! Part 2. Multiple blue-striped Basculin appeared in Kyurem VS. The Sword of Justice. Multiple red-striped Basculin appeared in The Mystery of the Missing Cubchoo!. Multiple red-striped Basculin and one Blue-Striped appeared in Going for the Gold!. BW037 Basculin Ash's Pokédex Basculin, the Hostile Pokémon. Basculin can be very violent and red and blue Basculin do not get along well, frequently resulting in battles. In The Key to Triple Battles, Cheren uses a red-striped Basculin against Monta in a Triple Battle. A member of the Shadow Triad used a blue-striped Basculin to attack Lenora at Nacrene City. Red and blue Basculin get along so poorly, they'll start fighting instantly. These Pokémon are very hostile. Red and blue Basculin usually do not get along, but sometimes members of one school mingle with the other's school. Red- and blue-striped Basculin are very violent and always fighting. They are also remarkably tasty. Blue-Striped Form are only found in rippling water. Red-Striped Form are only found in rippling water. Blue-Striped Form requires Good Rod, and Red-Striped Form requires Super Rod. Red-Striped Form requires Good Rod, and Blue-Striped Form requires Super Rod. Moves marked with a superscript game abbreviation can only be bred onto Basculin in that game. He likes the water where he lives, but he sometimes swims to another Area for fun. 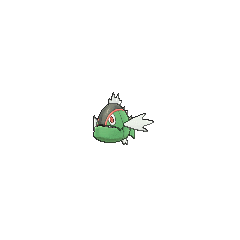 For other sprites and images, please see Basculin images on the Bulbagarden Archives. In Pokémon Black and White, blue-striped Basculin have the same two standard possible Abilities as red-striped Basculin—Reckless and Adaptability (and is listed as such in Pokédex 3D); however, the blue-striped Basculin that can be obtained via in-game trade in White has the Ability Rock Head. In Pokémon Black 2 and White 2, wild blue-striped Basculin's two standard possible Abilities are Rock Head and Adaptability, while red-striped Basculin's stay the same (and are listed as such in Pokédex 3D Pro). However, blue-striped Basculin bred in Pokémon Black 2 and White 2 have Reckless and Adaptability as their two standard Abilities. 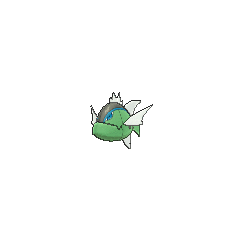 When a blue-striped Basculin with Reckless is transferred from Generation V to Generation VI, its Ability is changed to Rock Head. Basculin shares its category with Zweilous. They are both known as the Hostile Pokémon. 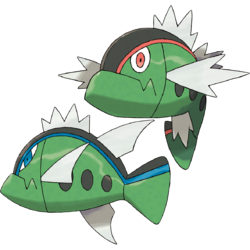 Basculin's Pokédex entries in Pokémon Black 2, White 2, X, and Omega Ruby describe the species as being very tasty, one of the rare instances that hint at Pokémon being used for food. 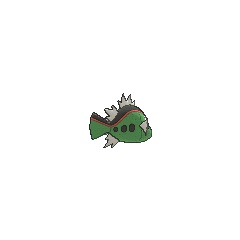 Basculin were most likely inspired by a bass or piranha, the latter of which has historically been viewed as violent. According to interviews with Ken Sugimori in Nintendo Dream, Basculin was made up late in development when they realized there were few new 'standard' fish-like Pokémon in Unova, the only others being Alomomola, Stunfisk, Frillish and Jellicent. It was given two forms to make up for the small amount of fish in the region, and based on a bass since there are wild bass in New York state. Basculin is a combination of bass and masculine. Bassrao may be a combination of bass and ?? masurao (warrior, referring to its bold, violent nature) or ???? bakarao (bacalhau). Korean ???? Bessnai From bass and ??? sana'i; may also be based on ????? sana'ida'um or ????? sana'ida'un.